The allure, glamour, and charm exuded by Audrey Hepburn are sources of inspiration for many women. In Being Audrey Hepburn, nineteen year old Lisbeth’s obsession with the beautiful star and her movies brings her to a place she never thought she would ever step foot in. Lisbeth’s life is not an easy one. Her father left her mother when she and her two siblings were young. Today, between her alcoholic mother, her angry sister, and her (criminally) mischievous younger brother, their house only has one safe spot where she can gather her thoughts. Inside her tiny closet, Lisbeth has escaped her reality countless times by following Audrey into alternate ones through her movies. This allows her to keep believing that somewhere, a better alternative is also waiting for her. Then one day, Lisbeth is given the opportunity to try on “the” black Givenchy Audrey dress (Hepburn fans, you know which one!) and, through a series of unfortunate circumstance – or fortunate ones? – she is welcomed into a world of socialites and celebrities with too much money and too much time on their hands. When one reaches for the stars, one can end up the main protagonist in a stereotypical rags to riches story. But more often than not, the story ends with the protagonist only a little ahead of the game, having learned important lessons that will come in handy as they pursue their dreams. And sometimes, the protagonist ends up in a place worse than where they started. The most realistic path seems to be the second option, and this is the fate that awaits Lisbeth. Cover blown, she is exposed as a fraud and has to deal with life-altering consequences. Some are heartbreaking, some are neutral, and some, thankfully, are positive: things are looking better with her family; Lisbeth used her adventures to help launch her friend Jesse; and her hastily started blog has caught the eye of a world-famous designer and an expert marketing agent. Being Audrey Hepburn is a quick, interesting read that unfortunately falls short because of the unwritten messages it shares. For example, Lisbeth is a hard-working student being forced by her mother to become a nurse practitioner. While I don’t think parents should force their children down a specific career path, the alternative that author Kriegman seems to be encouraging is to step into a rich and glamorous world and blog about fashion. While I love a good fashion blog, I do not think it’s wise to suggest it as a safe career one can hope to escape a more traditional career with. Furthermore, another underlying message seems to be that a job as a waitress or a career as a nurse are not fulfilling. And, finally, it seems to be encouraging the belief that unless it is glamorous, a job is a lowly, unworthy option. Another example: Lisbeth escapes her reality by delving into Audrey Hepburn movies. She also draws inspiration from the movie star’s real life ascent from unknown actress to superstar. But instead of learning from the latter, Lisbeth uses the former. That is to say, instead of learning from Audrey how to use her strengths to create realistic opportunities for herself and build her way, one step at a time, out of her current, very difficult situation, Lisbeth escapes her reality by stepping into a world of socialites and celebrities, a superficial and temporary situation that brings about some life altering consequences for her and her family. Perhaps these were not two points the author wanted to make in her book, or perhaps they would have been effectively addressed if Kriegman had actually wrapped up her book more tidily. While a book should end with some ambiguity, allowing the reader to imagine what is going on, the breadth and depth of the ambiguity of this ending leaves the reader wondering what lessons Lisbeth has learned. This is all the more unsettling that this book is intended for a young adult audience. Do we really want them to decide that the best way out of a difficult home situation is by conning their way into a social circle with more material goods that offer a superficial and fragile way out? It seemed at times that the author lost track the reason why the book was written. 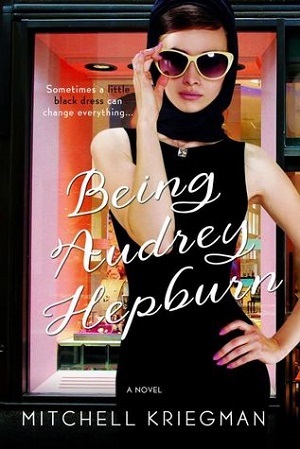 Is Being Audrey Hepburn just a fun book, a teenage soap opera with no other intention that to explore the idea of infiltrating the rich and famous? Is it about fashion, and glitz, and glamour? Then the more serious sides should be lightened, and more information about the rich and famous and fashion should be added. Is it a soap opera? Then remove a semblance to being a book of substance, and crank up the drama. Is it a book meant to analyse Lisbeth’s character and the consequences of her decisions? Is it a book meant to make readers reflect on how they can improve their situation in a realistic way? Then the lessons should have been more clearly drawn, and the author should not have diluted the development of Lisbeth’s character through the breadth and depth of the description of the glitz and glamour. This lack of focus is unfortunate, as Mitchell Kriegman is a good writer and managed to vividly bring to life some of the scenes in the book, but the lack of focus unfortunately really affected the quality of the story as a whole. These weaknesses could be addressed in the form of a book club or a discussion group about books; but I would make sure to engage any young reader who has gone through this book in a conversation about Lisbeth’s decisions to make sure that they did not get lost in the underlying, sometimes contradictory messages of Being Audrey Hepburn. First published here on Blogcritics.